Rakhine State is one of the poorest and most isolated parts of Myanmar, and suffers from complex humanitarian needs and unaddressed development needs. Already marked by a high rate of poverty, the socioeconomic situation in Rakhine further deteriorated in 2012 following the outbreak of violence between majority Buddhist and minority Muslim communities, which displaced many Muslim communities, who were relocated in controlled camps. The floods that hit Myanmar in July and August this year have exacerbated these problems, with no regard for the lines that have divided these communities for so long. Children from both communities – in camps and not in camps – have felt the impact on their education. SITTWE, Myanmar – Thu Zar Moe, 12, lives with her father and four siblings at Thea Chaung displacement camp, near Sittwe, the capital of Rakhine state. In 2012, her family fled their home in Ahnauk San Pya village. Thu Zar Moe (right) studies with a friend in a classroom at Thea Chaung displacement camp. They left behind a successful business and ended up dependent on food aid from the World Food Programme (WFP). Thu Zar was one of the brightest girls in her class, but she could no longer go to school. Without access to health care, her mother passed away. Thu Zar sits with her father, Hla Kyaw, on the porch of their small house, built with wood, bamboo and part of an old tent from UNHCR, the UN refugee agency. It is one of many such homes, tightly packed together. It’s raining, and the ground between the houses is wet and muddy. Luckily for Thu Zar, there is a way for her to continue her studies. She attends non-formal primary education at a temporary learning centre in the camp, supported by UNICEF and run by the Lutherian World Federation. Despite the heavy rain falling outside, the children concentrate on their studies. Girls sit on one side of the classroom and boys on the other. A teacher writes Myanmar language on a blackboard, and Thu Zar and the other girls read it out: “The man is building a hut. He wants a string to tie. Please watch out for leeches,” they chant, raising their voices above the hammering of rain on the roof. Hlaing Hlaing Oo (left) studies in Grade 6 at Mingan School, not far from the displacement camp. There are 115 children living in the camp who study at the learning centre. Last year, the top students got a chance to go to a new government-run middle school near the camp. Thu Zar’s teacher says that she is also likely to go. Although she has ambitions for her future, Thu Zar also assumes that she will still be living in the camp. “When I grow up I would like to work for WFP, because they give food to other people,” she says. In a village not far from the camp, 11-year-old Hlaing Hlaing Oo’s family struggles with poverty. Conditions in their community are poor, and many children and families have some of their basic needs unmet, with limited opportunities to earn a living. A few years ago, Hlaing’s parents left Myanmar to work in neighbouring Thailand as migrant labourers. They left Hlaing, and her younger brother with relatives in Yangon. 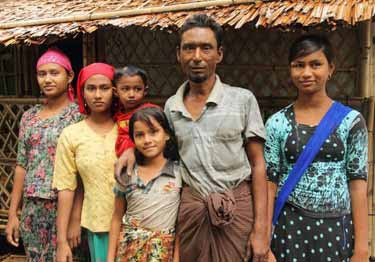 When the family returned to Sittwe, they did not have the right paperwork to get Hlaing into the local school. Unable to attend regular classes, Hlaing joined a non-formal primary education scheme at Mingan School, supported by UNICEF and run by Myanmar Literacy Resource Centres. Classes are held every day in the evenings for out-of-school children, including those who work during the day to support their families or stay at home to take care of younger siblings. Hlaing completed the programme, and this term she entered formal school as a Grade 6 student. On the first week of term, the school is full of noisy, excited children in white and green uniforms. Most wear the traditional Burmese longyi skirt. Between lessons, boys run around a grassy field and girls play skipping games in groups, taking advantage of a break in the rain. The lessons resume, and in Hlaing’s classroom, a teacher instructs the class in Myanmar geography. The children read from the board in unison, just like the children in the displacement camp. Although they belong to two different communities and live in different circumstances, both Thu Zar and Hlaing have similar hopes and dreams, and both see the value of education for their future. Education has the power to build on these shared dreams, to bring children together to build a joint future for Rakhine State. UNICEF, with support from Australia, Denmark, the European Union, Japan, Netherlands, Norway, Switzerland, Turkey, the United Kingdom and the United States, is working to ensure that all children in Rakhine State can develop to their full potential. To do this, we are working to tackle child poverty, promote development and child rights, and meet the humanitarian needs of people displaced by violence. In order to build a peaceful society, all children and families from all communities, need to be able to access services and live with dignity and equal opportunity, regardless of where they live. 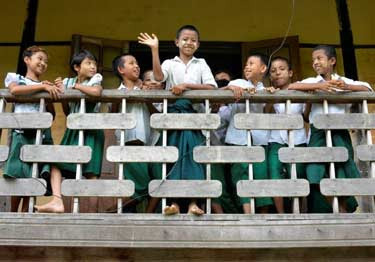 A student waves from a balcony at Mingan School. As well as the non-formal education provided to Thu Zar and Hlaing, UNICEF also supports life skills education for adolescents, provides school backpacks to all Grade 1 students in eight townships in Rakhine State, and stationery for Grades 1 to 5. This year, we are starting a school improvement plan and training in child-friendly teaching methods. The future of Rakhine lies in Thu Zar and Hlaing’s common dreams, as well as the aspirations of their supportive fathers. Hlaing’s father echoes the same sentiment. “My main hope for my daughter’s future is that she gets a good education,” he says.